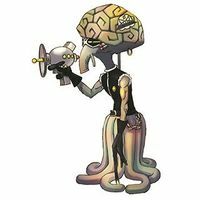 An Alien Digimon shaped like something that came from the far reaches of the cosmos. However, it is rumored that it was born from the seed of a plant. It could not be imagined from its overdeveloped head and octopus-like lower body, but it carries terrifying offensive power. The Abduction Kousen which it fires from the ray gun it holds in its hand is also a threat, and its Special Move Akuma no Nage Kissu is a terrifying technique which makes a complete fool out of the opponent. The "Delinquent Alien". Although it was a Vademon theorised to have come to Earth in order to invade it, it instead took on a form that was influenced by Earth's culture. While it believes that it has evolved to become even stronger, in actuality only its appearance has changed, and its sunglasses have in fact made it harder for it to see clearly. However, it is able to master skills which menace enemy Digimon, and is perhaps a step closer to invading the Earth. Tenshi no Low Kick, in which it smiles while kicking the opponent's feet, is a fearsome technique which completely distracts the opponent. n., From invader (「インベーダー」 Inbēdā). Akuma no Nage Kiss  Devil's Blown Kiss 悪魔の投げキッス Akuma no Nage Kissu Hypnotizes the enemy. 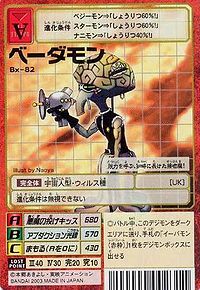 Abduction Kousen  Abduction Ray アブダクション光線 Abudakushon Kousen Attacks with the hand held blaster it carries. 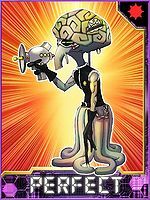 Vademon X-Antibody is only obtainable as a collectible card. Its card is part of the Mysterium Cosmographicum (宇宙の神秘 Uchū no Shinpi) set. This intelligent kissing demon drains the opponent! This page was last modified on 2 November 2017, at 13:04.